This recipe has made me very, very, very happy. Chocolate muffins. Double chocolate muffins. I’ve yearned for a moist, fluffy, chocolate muffin recipe for years but none have really lived up to my expectations. I don’t want a chocolate muffin that is basically a chocolate cupcake sans frosting – I really, truly want a chocolate muffin. Deep, dark chocolate flavor with a tender, moist crumb and light on sweetness. Not cakey. Muffiny. I need look no further. These decadent morsels of muffiny goodness completely exceeded my expectations. Perfect for a snack (divine with a tall glass of milk! ), simple breakfast or even doubling in as dessert (although I insist they are not a cupcake! 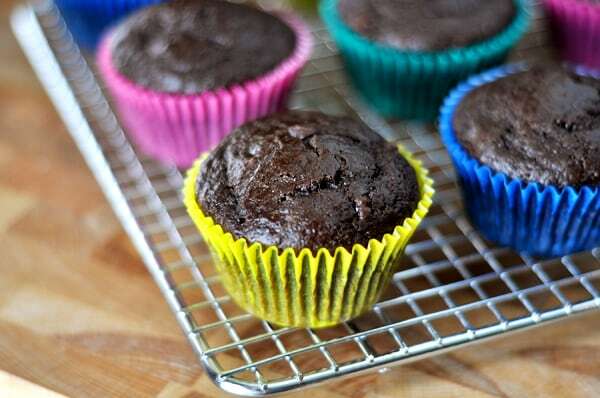 ), this chocolate muffin recipe is headed to the Best Recipe section fast. Almost as fast as we inhaled them. I hope they make you as happy as they made me. Really, I do. In a large bowl, combine the flour, sugar, cocoa, baking soda, chocolate chips and salt. Toss to combine. In a medium bowl, whisk together the eggs, sour cream, water (or juice), milk, oil and vanilla. Make a well in the center of the dry ingredients and stir in the wet mixture, stirring just until moistened (a few dry streaks and lumps are fine). Line muffins cups with paper liners and fill the cups 1/2 to 2/3 full. Bake for 16-18 minutes, until a toothpick inserted in the center of a muffin comes out clean. Remove the muffins to a wire rack to let cool completely. This recipe makes more than 24 muffins. Because I only have two regular-sized muffins pans and was impatient, I made the rest of the batter into 16 mini muffins. You could easily make all regular-sized muffins if you want. Also, I had some all-natural plum juice in the refrigerator and subbed that in for the water. The taste was unnoticeable but was a little boost in fruit and fiber. I think the water would work just as well, but if you have plum juice just sitting around, throw it in! SO YUMMY! I made these for general conference and they were very good! Can you half or third this recipe? I just wanted to say thank you for sharing your wonderful recipes. At the very last minute I finally decided to make muffins for my neighbor gifts this year. And of course I came to your site to pick a new recipe to try. I made 4 batches of these muffins and they were so delicious. I melted a little white chocolate to drizzle on the tops to look a little fancy and bam- the perfect neighbor gift. Thanks for being awesome!! and Merry Christmas! What a fantastic neighbor gift! If I was maybe thinking about hiding spinach in these would you change anything else up? I’ve never tried it, Megan – good luck if you experiment! I’m not really sure what else would need to be changed up in the muffins (less liquid, maybe?). I only made 24 muffins by putting a little more batter in each. They didn’t form mushroom tops by adding extra. I used a scoop to put batter in the pan. Baked for 18-19 minutes. Could you use greek yogurt in place of the sour cream? Have you tried coconut oil in this recipe? Thanks! PS We love your blog it is our go to for everything. You are a huge part of our life, Mel! Yes and yes! Both of those substitutions work great in this recipe (the batter will be slightly thicker with the coconut oil but it won’t affect the outcome). Thank you for the great recipe. I made this with my niece and she loved it. The muffins were moist and just the right sweetness. We added more chocolate chips (because we’re chocoholics) and it was divine. I will definitely be making this again. Thanks! Mel, these were every bit as wonderful as you said they’d be 🙂 I did add a few handfuls of frozen cranberries (because I can’t resist the combination of dark chocolate and cranberries) and they turned out soooo good!! Hi Mel. I have a question. Years ago I bought muffins from bjs. These muffins were more like a pound cake muffin. Do you think these taste like more pound Cakey than muffiny? If not, do you have a recipe like that? These are more cake-like – I’d say. Not dense like pound cake. I’m afraid I don’t have a chocolate pound cake muffin recipe although it sounds yummy! made these just now– they came out perfect. they had the nice dome shape and they were tender and moist. I made them in a mini muffin pan, and they were like the “brownie bites” I used to buy,only so much better, without the chemically store taste. I saw the ones at Costco today, and they are really just way too big. So glad I can now make my own home version. Thanks Mel. Yum!!! The first time I made these, I left out the chocolate chips (gasp)! The 2nd time, I used berry applesauce in substitution of sour cream, coconut oil, and added 1 1/2 tsp. cinnamon! They turned out so wonderful! Thanks for all of your hard work, I am a big fan! These are extremely GOOOD! My two teenage swimming sons eat through these like nothing and I’m so happy to have this simple, delicious recipe now. This makes exactly two dozen for me. Perfect!! I have been using buttermilk when I’ve made them because I happened to have a lot on hand. Probably overkill with the sour cream, but they turned out soooo gooood. Thank you, very much, for sharing! Mel, these muffins are fantastic. I made them this morning and got exactly 24 of them (I did fill them over 3/4 full because I was lazy and did not want to bake the extra batter). I just baked them a little longer, and they rose beautifully. They are so tender, have such a fabulous chocolate taste, and the chips are divine in them. These will be frozen for lunch box treats. I wish I discovered these sooner–I love all your muffin recipes! Made these this afternoon. Very good! Used coconut oil instead of oils listed. Used instant espresso instead of plum juice. Used full fat mill because I’m one of those lowfat haters. 🙂 Full fat sour cream also. Warmed coffee and full fat milk so that coconut oil would not clump up. Beautiful rise and baked just short of 16 minutes. The crumb is just right as is the barely there sweetness. Highly recommend and will make again! Thanks, Mel! ha! I used chocolate almond milk instead of milk. WOW!!! These were amazing! The only changes I made was I used coconut oil , I use this oil in everything I bake and I had to add an extra cup of flour because the batter was very runny but they turned out excellent. Thanks! Do you think honey Greek yogurt would work instead of sour cream? Amy – I think it’s definitely worth a try! Yogurt usually subs well for sour cream although if the yogurt has added sweetener, you might want to cut down a bit on the sweetness in the recipe. Did you put in all the pans of batter into the oven at the same time. Did they bake together I mean? viktoriya – Yes. They can bake together. I am glad you liked them. Could I use hot chocolate cocoa? viktoriya – I don’t think so – baking cocoa would be best. I made these today and they were great! I subbed in a cup of freshly milled whole wheat flour and, since I didn’t have sour cream on hand, I made some buttermilk using vinegar and regular milk and added 3/4 cup of the buttermilk plus 1/3 cup on butter. It worked great and the texture is amazing. I just know the other moms at church tomorrow will appreciate therefor Mother’s Day! Thanks for the recipe! I always LOVE everything you post! I love COSTCO choco muffins and these ones are just the same! Thanks for the greatest muffin recipe ever! Does it have to be lowfat? Can it be 2% milk perhaps? I only have one regular 12 cup muffin pan, would halving the recipe be enough for 12 muffins? Viktoriya – 2% milk will be fine. Cutting the recipe in half will still produce more than 12 muffins. Probably around 16 muffins. You could put the extra batter in a small loaf pan though. Just curious, what do you think would happen if I put toffee bits inside the batter? Viktoriya – I don’t know. I haven’t tried it, but it’s worth a try. If I halved this and made mini muffins would it fit in the pan? Viktoriya – Mini muffin tins differ by brand, so I am not sure if halving the recipe would fill up the muffin tin exactly. You can cook them in mini form though. I just backed it now, they are wonderful! I tried so many recipes and this one is the BEST!!! Moist and fluffy. I just made these and my kids devoured them! I used all 100% whole wheat flour, rice milk, and an egg substitute (ground flax seed and water) and they turned out wonderful. Tons better than the brownies I’ve been playing around with using whole wheat flour and egg substitute. Hello, I live in South Korea I’ve been looking for costco muffins recipe, really thank you for your recipe. I’m gonna make these muffins soon. Can I add melted chocolates in the paste? Hey I seriously can’t wait to make this recipe but I have a couple of questions. Baking cocoa it’s just the regular Hershey’s cocoa that you use for cakes? And does it matter if I use vanilla powder instead of extract? Thanks so much for the awesome recipe! Danny – yes, the cocoa is every day unsweetened natural cocoa (like Hershey’s). I’ve never used vanilla powder but if you successfully sub it in other recipes, it should work fine here. No pretty peaks on mine tho… could be the altitude (6200ft) but otherwise perfect! 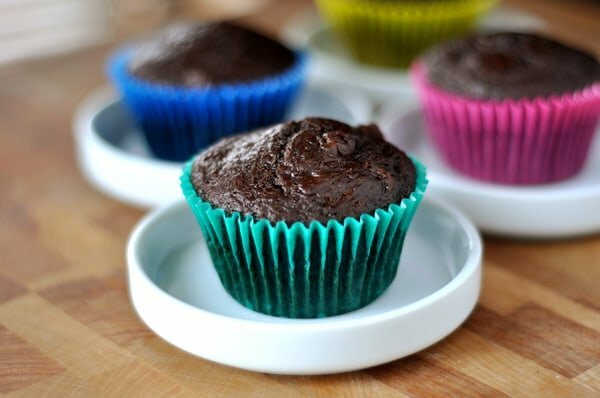 These muffins are the BEST chocolate muffins I have ever had! The recipe is super easy to follow. I only made a few minor changes: I increased the cocoa from 3/4 cup to a full cup, I used a *heaping full cup of sugar, I used 3/4 cup semisweet morsels + 1/4 white choc morsels, and I increased the vanilla to 1 1/2 tsp. Other notes: I used plain water in the recipe, canola oil, regular sour cream, and whole milk. SO moist, SO chocolatey, SO delicious! Thank you for sharing this recipe. I made these for a group at work today. They had rave reviews for them. ( I didn’t get one). I thank you very much for your generous heart. Just made these tonight for breakfast tomorrow. I tried one and they are so good! I did cut the recipe in half though to only make 12. They are perfect! Perfectly yummy!Perfectly Perfect. I used dark chocolate chunks. So I finally made these … and their ‘crumb’ is quite a bit like the Costco muffins, I was very pleased! I did add a bit extra sugar, I don’t know that I will next time. The only issue I had was that alot of the chocolate chips sunk to the bottom of the muffin (even though I mixed them with the flour first), making the bottom stick to the muffin papers. Still delicious though! Thanks Mel for all your fabulous recipes! My husband was excited to see this addition. We tried it with juice and then with the oil we only added 1/4 cup (instead of 1/2 cup) and then 1/4 cup strawberry yogurt and 1 mashed up banana. Turned out great and made the muffins super moist! Thanks for adding this one! May have to make these for Christmas morning…an easy, special treat before church! You rock, Mel!! I made these tonight. They are perfect, fluffy, light, not too sweet but very chocolatey. Thanks for the great recipe! Katie – I only baked my mini muffins for about 7-8 minutes. How long did you bake the mini muffins? Oh my goodness!! I am in the middle of making these as muffin tops and they turned out amazing!!!! I couldn’t wait to try them. So moist and fluffy! For muffin tops I put 1/3 cup of batter for each one and baked for 11 minutes. Thanks for yet another yummy recipe!! I made these the day you posted them. Scream. SO good! Making them again today for friends. I love the simplicity of the preparation, and the ending result. Moist and wonderful! Thank you!! I made these this weekend, substituting low fat plain yogurt for the sour cream because that’s what I had. They were delicious. Didn’t have any juice so I used water. I also substituted whole wheat pastry flour for the all purpose, which worked well also. Will definitely make again soon. Thanks! I made these as soon as I saw your post. They are so delicious! Just enough sweet without feeling like I’m eating a cupcake. Kind of dangerous, though, as I tend to use that as a justification to eat more than I probably should… Thanks for the recipe Mel! My kids love chocolate muffins. Moist, fluffy and chocolate-y!? I’m book-marking this and will make some next week. I made these last night—and can I just say–the BOMB!! I did jumbo muffins–it made 12 and I baked them for 20-22 mins. So moist–my family loved them!! Better than Costco they said! This recipe is a keeper. BTW–i used apple juice and it worked well!! YUMMY!! Ashley – yes, it’s different, but I’ve used both and they work great. Thanks for another great recipe! I made these tonight to take into work tomorrow. (Of course I had to ‘test’ one). They are really perfect. I so appreciate all your recipes! 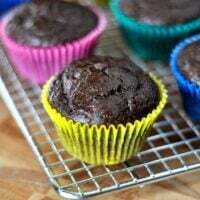 Made these this morning, and they are the best recipe I’ve tried for double chocolate muffins!! Thank you! Is plum juice different than prune juice? I am going to make these muffins RIGHT NOW! My kids will be so excited when they get home. I have made a couple very green recipes the past 2 days from the Curvy Carrot blog ~ Spinach bites and Mediterranean Salad. Last night I was looking at your blog (just found it this week) when my 6th grade son saw the pic of the muffins and exclaimed “make those!”. I said “Well, I think I wanna try the Black Bean and Pumpkin Chili recipe first.” He replied “Tonite you fed us green balls and now pumpkin?” I cracked up. Aren’t boys wonderful! I will be making the chili though substituting venison steak that my hubby bravely supplied us an entire freezer full of this fall. Always looking for recipes that will work with venison. So glad to have found your blog! so when I imagine the best chocolate muffin – it’s the Costco ones. and this kind of looks like them!!! Do they taste like them?!? Mame – hmmm, same but different? How’s that for an answer? They aren’t quite as sweet, I’d say (but you could always add a bit more sugar to accomplish that fact) but other than that, they are pretty close (except for the decrease in size since the Costco ones are gargantuan). To be honest, I haven’t had a Costco muffin in years since there aren’t any close by, so if you try them, you’ll have to weigh in and let me know what you think. Yum! I guess if they’re called muffins that makes it okay to eat them for breakfast, right? 🙂 They sound wonderful! I just made these for the kids after school. They are very light and moist. I used a scant cup of sugar. I think next time I would go with the full cup plus a few tablespoons–just personal preference on the sweetness. (Which suprises me, because I am with you, Melanie. Muffins should not be cupcakes!) Thanks for sharing a great recipe! Yum! Can’t wait to try these! Do you think pomegranate or blueberry juice would work? Anna – yes, I think either of those juices would work great! These sound wonderful. Can’t wait to try them! This sounds great! I love chocolate muffins, and like you said- I don’t want a pretend cupcake.. I want a MUFFIN. Can’t wait to try this one ! These turned out great even though I subbed 1 cup applesauce for the sour cream and eggs for my allergic daughter. Delicious. These look delish! I will have to make them soon. Mel, do you have any suggestions for a very good dessert that I can take to my Ladie’s Bible study this weekend? So far we have had cherry dump cake, apple crumble and cookies. I’d like to make a good impression on these gals! Thanks! I made these this morning and they are so delicious! We LOVE muffins at our house and will be making these regularly. Thanks for sharing! Also, I have made more of your recipes than I can remember and they are always fantastic! Thank you so much for posting this the day before I start my diet!! I am going to make them today and eat them all. Well, I might share one or two. Is plum juice readily available in stores? Does it affect flavor? Kim – yes, plum juice is widely available and no it doesn’t affect flavor at all. I wouldn’t necessarily go looking for it (I just used it because I had it on hand) – you can easily use water. These look SO GOOD!! Could I substitue plain yogurt for the sour cream? Beth – I don’t know for sure as I haven’t tried it but plain yogurt is usually a good substitute for sour cream so I’d say go for it! I used plain greek yogurt and they turned out great. I will probably start with a half-recipe of these, because they sound so good and because, well….that’s just a good idea for right now. Also, our local PBS station had something of an America’s Test Kitchen marathon this weekend, and one thing that I learned on one of the shows was that dairy products supposedly ‘dampen’ or ‘block’ some of the chocolate flavor in baked goods…so they were using water or coffee instead of milk, but I don’t know what would substitute for sour cream. They were making brownies…and Texas sheet cake, and I know that in the sheet cake they substituted water and a bit of vinegar (for ‘tang’) in place of the buttermilk. Just something I learned that I thought I’d share…but I will start with your recipe for sure – thank you! Um… I think my dinner plans for tonight just changed. You have amazing muffin recipes! I can’t wait to try this one! I have been looking and looking for a chocolate muffin/bread recipe. Thank you for coming through and posting this. Not only do I now have the recipe but I also know it will be delicious. Do you think this would work as a bread as well? Brandie – hmmm, I’m not sure about that. It’s worth a try but you’d definitely have to play around with pan size since I’m not sure what size(s) the batter would fit in. I worry that the bread might get a little dry due to a much longer baking time. Let me know if you try it, though! Wait… whats wrong with cupcakes for breakfast? Haha, just kidding, kind of. These look to die for. I’ll surely add them to my never ending list of muffin recipes I’ve got bookmarked. I have also been looking for a really good chocolate muffin recipe, and you described these so nicely that I just might have to try them! But I can use regular milk, right? And do I need to add sour cream? Thanks for posting this recipe!!! Mindy – I don’t think you want to leave out the sour cream. The recipe needs the mild acidity to work so I think the sour cream (or plain yogurt for a substitute or something like that) is essential. And yes, any kind of milk will work. Oh…these are SO calling my name right now! They look so fudgy and decadent! I have never had plum juice (gasp! ), but I think coffee would be a good substitute for the water. There is something about adding coffee to chocolate recipes that deepens the chocolate flavor. I am making these this weekend, Mel!